At the end of a hearty meal, do you find yourself yearning for that certain something to cleanse your palate, satisfy your sweet tooth and aid in the digestion of everything you just consumed all at the same time? Look no further than the sweet, penetrating citrine pop of a smooth shot of limoncello. There really is nothing simpler: spirit, lemons, sugar. Peel some lemons, steep them in alcohol, add some sugar-water, strain, bottle, pop in the freezer, and viola, you have limoncello. It can be good or not so good. Too bitter or too sweet, not lemony enough or too strong, but in the end, after indulging in copious amounts of rich Italian food, you find yourself immensely pleased to be sipping this lemony delight. I’ve never had much luck with the store-bought versions of the stuff, many are too sweet or don’t have enough kick. We have a friend who makes some for us every year for Christmas, and it’s fabulous. 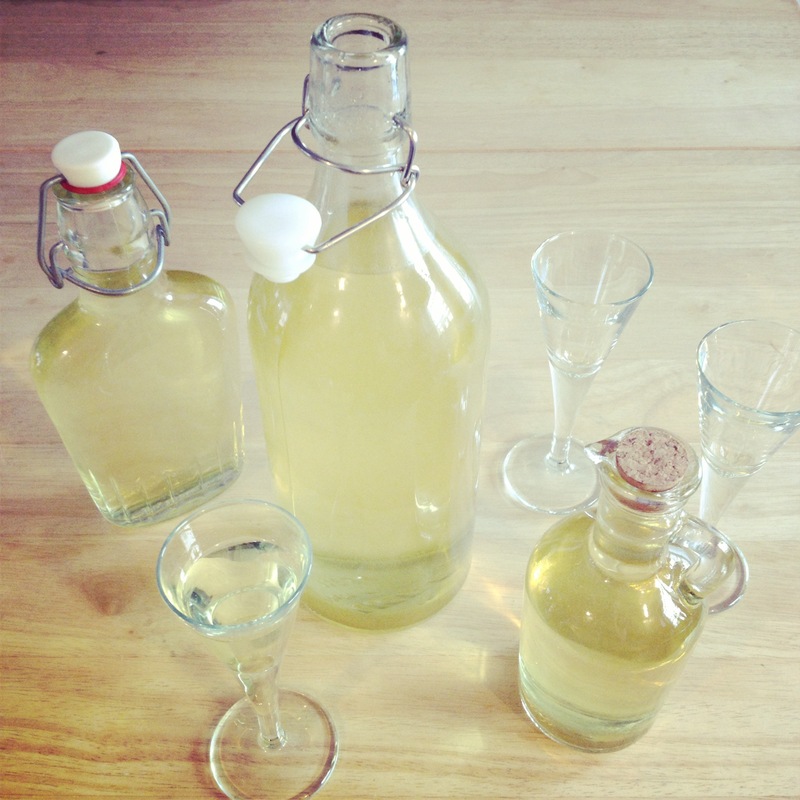 With our supply depleted, I wanted to see for myself just how easy it is to make homemade limoncello. Side note: I love food favors – what’s a more perfect favor for a dinner party or bridal shower than a perfectly portioned bottle of limoncello (check your local craft store for cute bottles – the one pictured above with the cork is from A.C. Moore)? Making limoncello isn’t an exact science, depending on who you talk to, everyone has a different take on how it should be done. Here’s how I made mine. 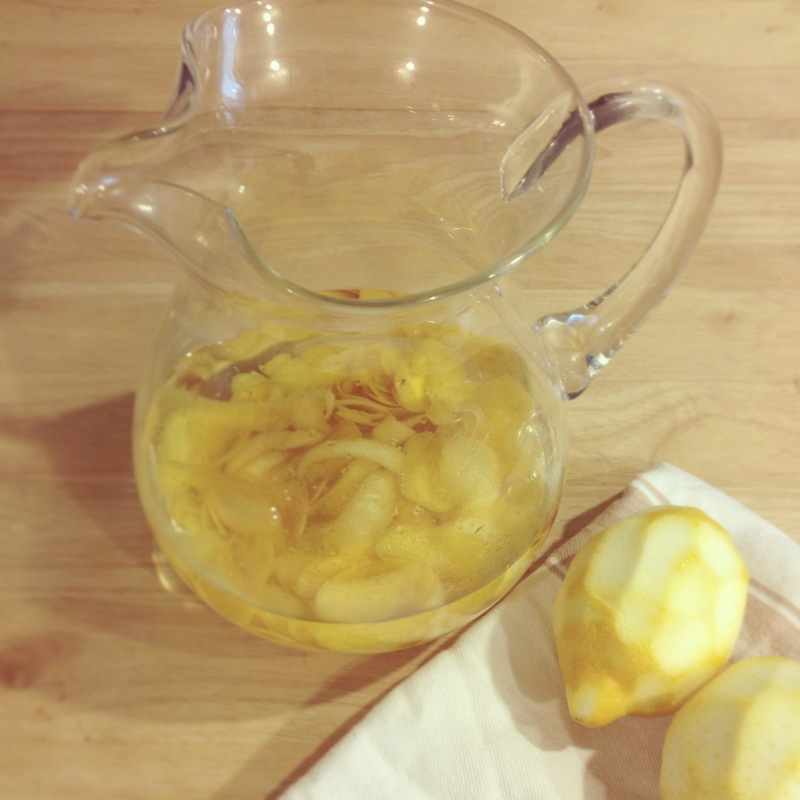 Using a vegetable peeler, peel the lemons and place the peels in a large pitcher. Pay careful attention to not peel the white pith (it’s bitter tasting). Pour the vodka over the peels and cover with plastic wrap. Steep the lemon peels in the vodka for at least 4 days at room temperature. To make the simple syrup (sugar-water), stir the water and sugar in a saucepan over medium heat until the sugar dissolves. Cool completely. Pour the simple syrup over the vodka mixture. Cover and let stand at room temperature overnight. Strain the limoncello through a mesh strainer. Discard the peels. To help with the flavor and clarity, you should strain the mixture again through a coffee filter (tedious process). Transfer the limoncello to bottles. Seal the bottles and chill for up to 1 month. Bonus Points: For a refreshing, slightly alcoholic, summertime party beverage, convert your limoncello into a limoncello spritzer. Combine equal parts limoncello with seltzer water, add ice and garnish with lemon slices!